The Earth has never stood still. Change is built into the life of the planet, whether physical changes to the surface of the Earth  through the slow action of erosion or glaciation  or biological changes to the species that populate it. We only have to go back to the last ice age  which peaked just 20,000 years ago, a coffee break in geological time  to see a climate that is utterly different from the one human beings have thrived in for the last few thousand years. Heraclitus had it right: the only constant is change. So it's not the fact that the global environment and the climate are changing that so worries many scientists. It's the rate of change  and whether or not human beings, and everything else that lives on the Earth, can adapt. Because the Earth, it turns out, is changing very, very fast. This is the sobering conclusion of a study published in the journal Nature earlier this month. Scientists from around the world looked at past research on ecological change, and found that the planet may be approaching a "critical transition," otherwise known as a "tipping point," as a result of human activity like agriculture and urbanization. The Earth has experienced tipping points before, during great periods of mass extinctions, like the death of the dinosaurs, and most recently when the last ice age ended around 11,000 years ago. But the idea that the Earth could undergo such a change while we're living on it  and that it could potentially happen in our lifetimes  is frightening. "It really will be a new world, biologically," said Anthony Barnosky, a professor of integrative biology at the University of California-Berkeley and a lead author on the paper. "This could happen in just a few generations." It's important to understand just how much human beings have changed the planet. Human population has quadrupled just in the past century, and today we add around 77 million people a year  an increase that is three orders of magnitude higher than the average yearly growth humanity experienced as recently as 400 years ago. We've converted 43% of the Earth's land to agricultural or urban landscapes  with farms taking up most of that space  and even the remaining territory tends to be crisscrossed by roads. That's a larger amount than the 30% of the Earth's surface that went from being covered by ice to being glacier-free at the end of the last ice age. We've increased the atmospheric concentration of carbon dioxide by more than a third, we've made the oceans more acidic and we've presided over the disappearance of so many species that many scientists believe we're living through the sixth great wave of extinctions All of these changes are speeding up, not slowing down. So is it possible that we really could be nearing a tipping point? No one can say for sure, and environmentalists have been burned in the past by premature predictions that the world was on its way to ending. But the Nature authors note that current trends suggest that half the Earth's land surface will be disturbed by human activity by 2025  and that could represent the point of no return for a livable planet. "Looking into the past tells us unequivocally that, yes, it can really happen," said Barnosky. "I think if we want to avoid the unpleasant surprises, we want to stay away from that 50% mark." Unfortunately, we aren't doing a very good job of that. Another report released last week by the U.N. Environment Programme (UNEP) found that little progress has been made over the last five years on 90 of the most crucial environmental goals. Significant progress has been made on just four of those objectives. 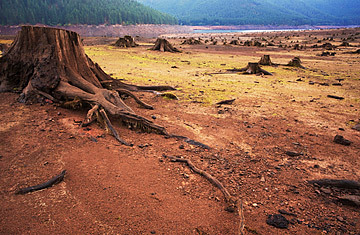 And there is little expectation that the Rio+20 Earth Summit, which begins next week, will make much of a difference. "This is an indictment," UNEP executive director Achim Steiner said at a news conference in Rio de Janeiro last week. "We live in an age of irresponsibility that is also testified and documented in this report." Of course, in some parts of the world  the high Himalayas of Nepal, in the desperately poor and hungry parts of sub-Saharan Africa, in the hot and dry patches of the American southwest  a tipping point may have already been reached and passed. The scary thing about a tipping point is that you only know for sure that it exists once you've reached it  and after that, it's too late to go back.